Would you or your company like to sponsor us? With the addition of matched funding, our 2015 JASG series raised £5020.74 which allowed us to donate £2,944.40 to the ‘War Child’ and £2,076.34 to the ‘Save the Children’ charities. They provide life-changing support to the most vulnerable children whose families, communities and schools have been torn apart by war. 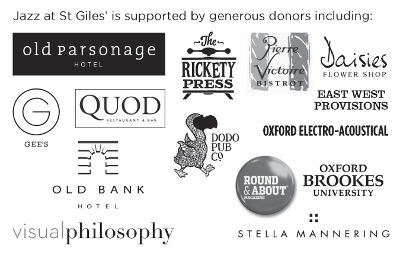 We are enormously grateful to our sponsors, including our next-door neighbours at The Old Parsonage Hotel and other local businesses, individuals and organisations, including staff and students from the School of Arts at Oxford Brookes University, without whom our series of fund-raising concerts featuring star performers from the world of Jazz locally and nationally could not take place. In order to provide profits for our chosen charities, the Jazz at St Giles events have to be at least self-funding, so we value donations towards our costs for the event. If you are able to provide a donation or sponsorship, please find out how you can make a donation towards our costs.